Andrew Byrom: Do We Need Business Cards? DCA instructor and 3D type designer Andrew Byrom has been contemplating this question and isn’t convinced that YES is the answer. Hear him deliberate in this video. For more on this topic, check out this post on his recycled desk. Here is a video that features Andrew Kutchera’s Typgraphy class last fall quarter from Korean cable-tv station (UGA), along with Dean Cathy Sandeen. Sara Vadgama, who is currently an intern with The J. Paul Getty Museum, has a starring role. In the United States, 72% of women are an active member of the workforce. Out of the developed nations, the United States is only one that does not offer special programs that assist married women with job placement. 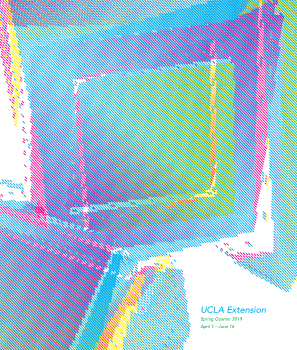 Located in Southern California, UCLA Extension offers approximately 4,000 lectures [on a quarterly basis]. Lecture subjects include studying for a specific license, learning more about a profession, [or] expanding one’s knowledge about an industry. [Currently] UCLA Extension has approximately 120,000 registered students and 60% of them are women. Many of these female students are married women who are looking to reenter the work force. Through institutions like UCLA Extension, women are able to update and maintain current knowledge about their industries that may otherwise be outdated since they’ve left their profession. The greatest benefit to receiving training at continuing education institutions is that students can learn about all the different changes in their respective industries even if they have been away for long periods of time. Continuing education institutions allow students to network with [local] established companies. After studying at UCLA Extension, students are about to seek a wider spectrum of potential employers. Currently, most women return to their profession at a lower position than when they first left. This is because while they have been away, their knowledge base has not grown and therefore is only suited for a lower position. After expanding and updating their knowledge base about their industry through continuing education institutions like UCLA Extension, women regain their confidence even if they have been away from their profession for a long period of time.